I recently had a TCA chemical peel done. Anyone that has had one of these can tell you that this is serious stuff. I love my glycolic peels and try to get one of those done about once a month. I have a great tolerance for them and have them done at a 70% 1.0......This means they are strong. The TCA peel was wayyyyyy more than that. It left my skin looking like it had come through a nuclear blast!! It had taken on a leathery/lizardy appearance! I wasn't worried because that is what they are supposed to do! The important thing to remember during your peel time (usually a few days) is to keep it moisturized and something on it to help it heal. 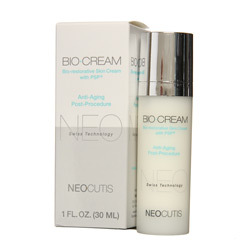 I had picked up some Neocutis bio cream in a swag bag and decided it was time for it to work its magic if it had any! First thing I noticed was the fragrance. Ya know when you were little and you would get a new baby doll for Christmas and it smelled like new fresh vinyl? That is what bio cream smells like. Not a bad order just different from any other. The results how ever were amazing. My skin peeled quickly and evenly, it looked fresh, new and dewey! they more I use this stuff the more I notice a change in my skin and I love it. I have also been using the Lumiere eye cream which was just voted best eye cream for the fifth year in a row!! and it is equally amazing! I would recommend this to anyone wanting to keep their skin in top shape!